Libby Schaaf was sworn in as the newly elected mayor of Oakland today. The entire city council is controlled by the real estate and other corporate interests, as their campaign finance disclosure reports show. But in Schaaf’s case, she won the election because she was the best-connected candidate. A brief glance at her campaign finance reports show that. There’s also one other point: There are two liberals on the city council (Rebecca Kaplan and Dan Kalb). They are up there for window dressing. Sometimes, when it’s clear the real estate interests are going to win, they will vote against the majority. That’s what they did, for example, in the issue of giving away 58 acres of precious public park land for free to the corporate controlled Oakland Zoo for them to develop into a theme park. But the one thing they won’t do is really expose the others for who they are. They always are sure not to burn their bridges behind them, always sure to maintain friendly relations with the more out-and-out corporate representatives. They are the friendly public face of a corporate-controlled political system. When we get working class representatives elected, they must not compromise, they must not get sucked into keeping a friendly, “working relationship” with these representatives of Corporate America. 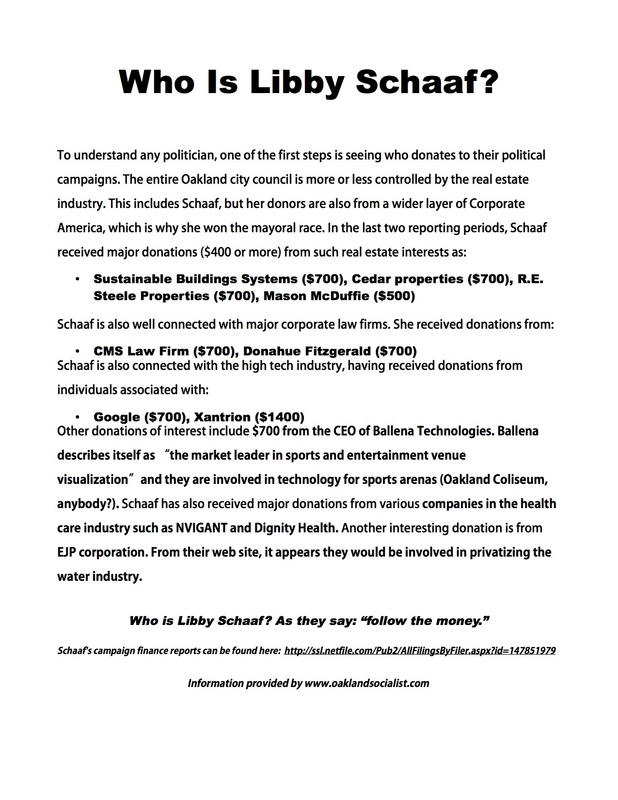 so Schaaf received a small donation from a small company that builds straw bale houses, and that makes her a tool of the “real estate industry”? Aren’t there some better examples? I’m shocked at how few donations she received from businesses and how small they are. If you look at her campaign finance reports – or those of any of the council members – you will see that it appears that $700 is the maximum allowable donation. So these donations aren’t minor. As for the number of them, we only gave a small sample. If you look at the reports, you’ll see that the number of such donations is far larger. And not simply from companies that build straw bale houses.